The Europe industrial gears market contains a large number of global as well as regional players, operating amidst in an environment of intense competition, according to Transparency Market Research. Some of the market’s notable vendors are Klingelnberg GmbH, Siemens AG, Precipart Corporation, Bonfiglioli Riduttori S.P.A., Renold Plc., and BMT International S.A. The requirement for high volumes of capital for installing new industrial gears manufacturing and designing facilities has deterred new entrants from the Europe industrial gears market. Companies can consequently expect a medium-level of impact from new entrants making competition more intense over the coming years. Gear design innovations could assist in the development of a new spectrum opportunities in the Europe industrial gear market and several market players are seen to focus on designing gears that can be less noisome, heat producing, and have an extended lifecycle. TMR estimates that the Europe industrial gears market was valued at US$24.21 bn in 2015 and will reach US$35.23 bn by the end of 2024, after expanding at a CAGR of 4.5% through a forecast period of 2016 to 2024. “The manufacturing industry in Europe has been showing signs of life over the past few years, with several key countries upping their production rates as the economies recover and consumption rates improve. 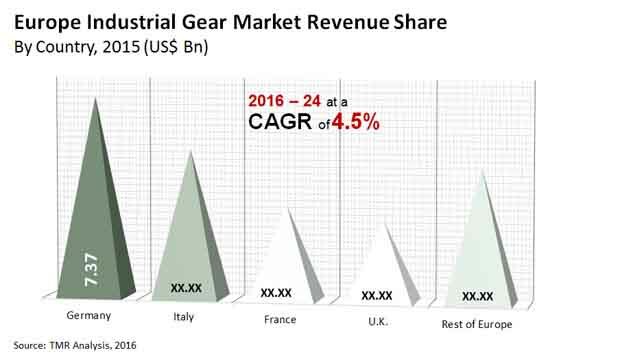 As a result of the manufacturing industry’s upswing, the Europe industrial gears market has been witnessing a strong surge of growth as well,” states a TMR analyst. The industries of automotive, steel, cement, paper, and plastic have witnessed a greater level of upswing post 2009 and are continuing to show a positive rate of growth in operations, thereby prompting not just a greater rate of demand for gears, but also driving players in the Europe industrial gears market towards greater innovations. Industrial gears are required to be highly efficient, reliable, and long lasting, factors which gear manufacturers need to take seriously. Helical gears have so far shown a lead in the Europe industrial gears market in terms of demand volume, but are likely to decline in usage rate due to the introduction of better industrial gears and the fact that helical gears produce a high rate of heat and are not as efficient as modern gear types. From a regional perspective, Germany has shown the leading demand for industrial gears over the recent past and is likely to continue being a key region for the market. There are still several factors responsible for the restraint expressed on the Europe industrial gears market. One of the leading restraints on the market at the moment is the high costs associated to the acquisition and maintenance of most modern industrial gears and gear systems. Most industrial gears are subject to a very high rate of effort and stress, and poor maintenance can result in a steady rate of aversion shown by end users. Neglecting routine maintenance or misuse of equipment creates major complications in industrial gears, significantly reducing their overall lifespan.